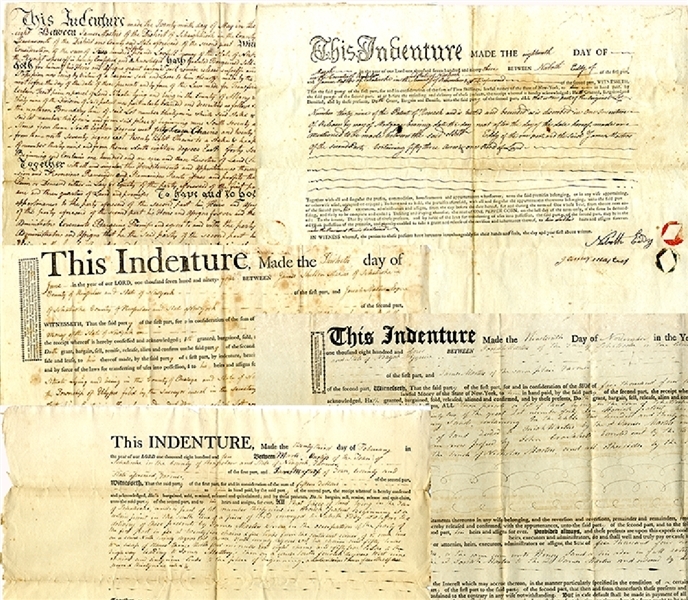 Each indenture records a James Masters of Schaightiock, New York buying land from various people. they include, Fully manuscript, 15” x 12-1/2”, May 29, 1788, from James Leavenworth for 240 pounds, a lot of property in Hoosick Patent as detailed within the document. ... plus, A partially printed Indenture 17” x 12-1/2”, March 18, 1793, whereby James Masters of Schaightiock, New York buys property from Naboth Eddy in Hoosick Patent as detailed within the document. ... plus, A partially printed Indenture 18-1/2” x 15”, June 13, 1794, between James Masters of Schaightiock, New York and Jonah Masters, Esquire, for 135 pounds for a parcel of land as described in detail. ... plus, A partially printed Indenture, 21” x 16-1/2”, November 19, 1804, between Jonah Masters of Schaightiock, New York and James Masters for property as described in detail. ... plus, A partially printed Indenture, 17” x 13-1/2” February 23, 1810 between Mark Curtis and James Masters for property as described in detail. All VG.